Figure: Example of a Publish Form for a recipe; it contains multiple fields to fill out. 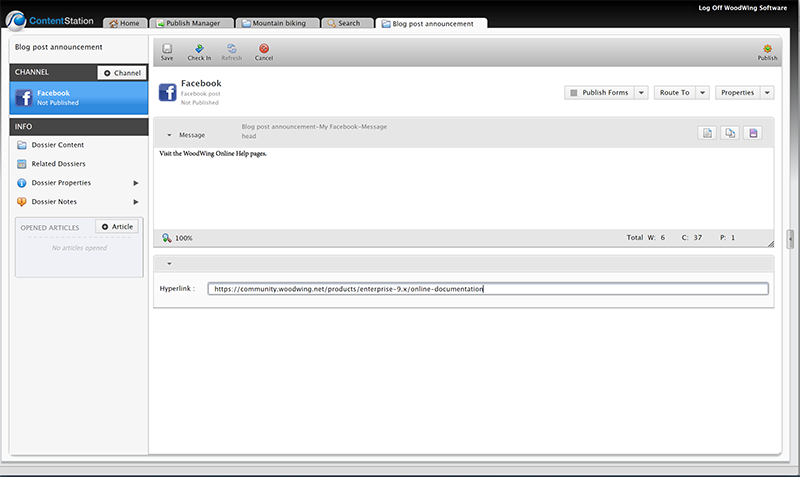 Figure: Example of a Publish Form for publishing to Facebook; it only contains 2 fields to fill out. The introduction of Publish Forms does not change the concept of publishing in Enterprise: it is still based on a story which is represented by the content of a Dossier. In fact: Publish Forms can only be viewed inside a Dossier. Content can also still be used across Publication Channels. What Publish Forms add is an efficient way of collecting the necessary content (in the form of metadata, articles, images and so on) in one convenient view. You can open a Publish Form from anywhere in Content Station by double-clicking it.When doing so, the Dossier will be opened and the Publish Form will be shown. 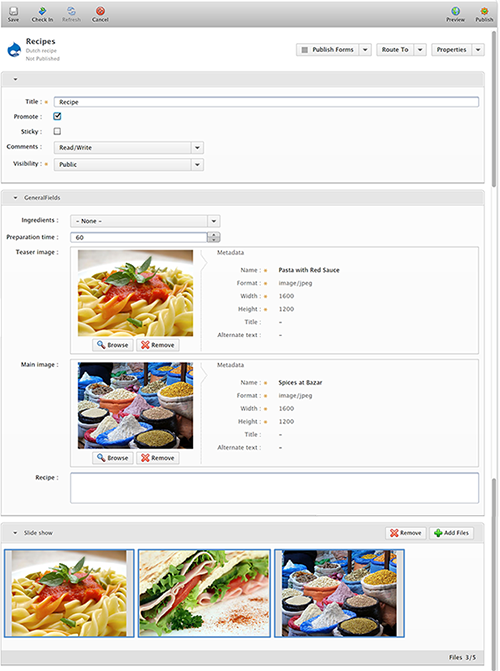 Publish Forms and Publish Form templates can be located by using any of the search features of Content Station. They also appear in places such as the Inbox, Recent Items, and Favorites. The Publish Manager can be used for managing Publish Forms. Note: Although Publish Forms can only be viewed in a Dossier, they actually do not appear as files in a Dossier (meaning: you won't see them among the list of other files in the Dossier such as articles, images and so on). The reason for this is to keep the Dossier clean of files that are not relevant to use at that time. If you are looking for the actual Publish Form or Publish Form template files, use the Search application, the Publish Manager, or look inside a Dossier in the Planning application. As with any other file type in Enterprise, you can assign a workflow status to Publish Form and Publish Form templates, route them to other users and right-click them to access the context menu for accessing further commands. Managing Publish Forms can also be done by using the Publish Manager in Content Station.